Managers of restaurants and other foodservice operations need to know how to cook - but do not have to be chefs in order to manage them effectively. 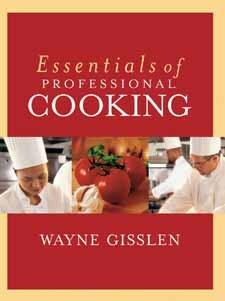 Written by Wayne Gisslen, author of the bestselling Professional Cooking, this book gives managers in the foodservice field the information they need about cooking in order to do their jobs well. Essentials of Professional Cooking is a unique, fully illustrated, color book targeted to managers rather than chefs. It contains everything foodservice professionals need to know about the kitchen to run their businesses effectively. Tens of thousands of aspiring and professional chefs have looked to Wayne Gisslen�s Professional Cooking to acquire the essential knowledge they need to succeed in the business. Specially designed to meet the on-the-job demands of foodservice managers. Essentials of Professional Cooking distills core information from this outstanding resource to offer a new streamlined approach to cooking basics�from tools and equipment, sanitation and safety, and cooking principles to recipes, menus, and more. Illustrating general cooking theory with specific applications in the kitchen, this new book details how basic techniques, such as roasting, saut�ing, braising, or grilling, are applied to a variety of ingredients. Essentials uses recipes to reinforce technique and features every sort of dish, occasion, and meal category a foodservice manager needs to know, covering breakfast preparation, hors d�oeuvres, soups, sandwiches, sauces, salads, meat, poultry, and fish and shellfish. Designed for everyday reference, the book includes hundreds of full-color photos that illustrate basic manual techniques and highlighted boxes that provide at-a-glance information. The accompanying CD-ROM, with its popular ChefTecTutor software, allows users to edit, modify, and print recipes (including hundreds of additional recipes from the original Professional Cooking); adjust portion size; conduct recipe searches by ingredient, meal, and cuisine type; and calculate nutritional analysis and recipe cost. Presenting foodservice managers with all the know-how of the original volume in a highly practical format, Essentials of Professional Cooking is the ideal resource for keeping the kitchen, service, costs, and the daily life of a restaurant in good working order.